Tarrytown NY Real Estate Company | Tarrytown, NY Real Estate Broker | Buyer's Edge Realty, Inc.
99.75% of all "buyers' agents" by law also represent the interests of home sellers and cannot guarantee loyalty to home buyers. We Can & Do- Guaranteed! Plainly stated we are the best kind of real estate company for Westchester home buyers. immediate response, please call us today! "...above and beyond our expectations." Excerpt from Client's letter - See Testimonials page for full letter. "You found us the perfect place." "Far surpassed our wildest dreams of what a Buyer's Agent/Agency might be!" - Gregory & Alana M.
"I can't imagine entering the home buying process ever again without your services..."
- Rob & Lena R.
"Buyer's Edge is our Realtor for life." - Lyneisha & Eddy P.
Read About Us in the Journal News! Buyer's Edge Realty provides home buyers with the highest levels of loyalty, representation, and protection throughout Westchester County, NY. Call us to discuss your home buying needs, wishes, and lifestyle considerations. We'll thoroughly explain the home buying process in Westchester including mortgage preapproval and financing, home search and property viewings, identifying property attributes and concerns, understanding assessed value and property taxes, municipal requirements, analyzing market value, negotiating price and terms, home and environmental inspections, and attorneys and contracts. You will leave knowing far more about your home search parameters and purchase options. This information often helps home buyers save time and money. Our highly informative meeting is provided at no obligation or cost to you in a relaxed and comfortable environment. Buyer's Edge Realty is one of a very small handful of TRUE Buyer's Agents in Westchester County. As Realtors we have access to show any property listed on the Multiple Listing Service (MLS) or from any other source. Our policy of NOT listing homes for sale ensures 100% company loyalty to home buyers 100% of the time. Not listing homes enables us to concentrate on the needs and wishes of our buyer clients- never home sellers! This practice further eliminates the risks and limitations of dual agency which is commonly encountered when dealing with a buyer's agent working from a seller's agent listing company. 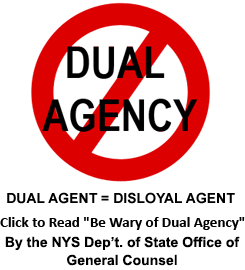 Eliminating dual agency is a huge benefit to home buyers- dual agency financially rewards the real estate listing company with a double commission and transaction control while greatly compromising the buyer's interests. Our company is compensated just like any real estate broker- our services are paid for at the closing from the proceeds of the transaction. In addition we invite you to speak with our very happy and satisfied past Clients by reviewing our Testimonials- the names and phone numbers of Clients and original copies of their letters are available to you during our meeting. Thank you for visiting our website- we look forward to speaking with you! Serving all areas of Westchester County, including Ardsley, Armonk, Bedford, Bedford Hills, Briarcliff Manor, Bronxville, Buchanan, Chappaqua, Cross River, Croton Falls, Croton-on-Hudson, Dobbs Ferry, Eastchester, Elmsford, Goldens Bridge, Harrison, Hartsdale, Hastings-on-Hudson, Hawthorne, Irvington, Jefferson Valley, Katonah, Lake Katonah, Larchmont, Lewisboro, Mamaroneck, Mohegan Lake, Mount Kisco, Mount Vernon, New Castle, New Rochelle, North Castle, North Salem, Ossining, Peekskill, Pelham, Pelham Manor, Pleasantville, Port Chester, Pound Ridge, Purchase, Purdys, Rye, Rye Brook, Scarborough, Scarsdale, Shrub Oak, Sleepy Hollow, Somers, Tarrytown, Thornwood, Tuckahoe, Valhalla, Vista, Waccabuc, White Plains, Yonkers, Yorktown, Yorktown Heights.